The United Nations Development Programme (UNDP) office in Somalia has issued a Request for Proposals for the financing of a skills development program in the solar energy sector in Mogadishu, Kismayo and Baidoa. The government is making an effort to encourage the use of renewable energy across Somalia. The Request for Proposals outlines how one of the biggest challenges facing the development of the solar energy sector in Somalia is the shortage of qualified personnel and technical skills, which is emphasized by the absence of skills and qualification measurement infrastructure, which in turn leads to the current low quality of labor. It wishes to get finance for a training program of 400 youths in developing their vocational and business management skills, and finding them suitable job placements in three locations, with an equal amount of both men and women being trained in the program. The development program is looking to be a launch-pad upon which other programs can begin to solve the many energy problems facing Somalia. Currently, 84% of Somalis do not have access to a regular source of power. The country does not have a national grid, relying on outdated, costly and inefficient diesel generators. Furthermore about 90% of energy consumption in Somalia is dependent on firewood and charcoal, dependencies that rely on deforestation and desertification, which negatively influence the agricultural sector. Solar in Somalia has been progressing recently, albeit slowly. The government recently launched a solar power system to be used by the Office of the Prime Minister in Mogadishu. The project is looking to promote the use of renewable energy across the African country. The project was supported by a grant from the OPEC fund for International Development (OFID), and supported by the UNDP which, working alongside the Ministry of Energy and Water, installed 298 solar panels, including a hybrid solar system, which will save 35% on fuel consumption, or 120 liters daily. “Solar energy potential could be better exploited in Somalia, which enjoys over 310 sunny days, almost 3,000 hours of sunshine, yearly. This makes it an ideal environment for generating clean energy through solar,” he added. The government is making an effort to encourage the use of renewable energy across Somalia, and has incorporated them in its National Development Plan. The OPEC Fund for International Development (OFID), alongside the UNEP, aims to accelerate the rate at which the provision of affordable and clean energy across civil service offices in Somalia is provided. Six additional government offices will each be provided with 1.5 kW solar system in the near future, and 500 solar lanterns are to be distributed to rural communities and centers without access to reliable sources of energy, with 50 youths to also be trained in the operation and maintenance of solar energy equipment. The “government” controls the larger cities and town in the southern third of the territory. It has no control over the middle third (Puntland). 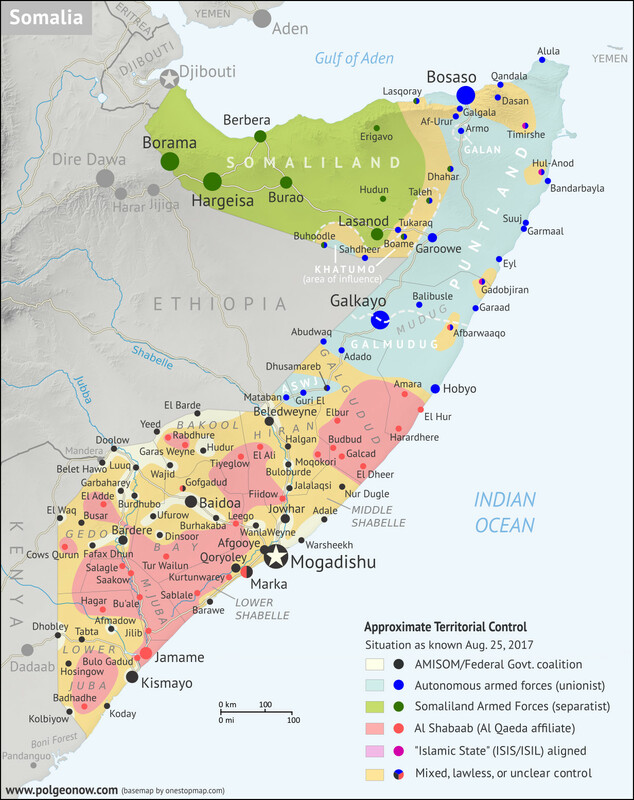 Somaliland, the NW third, has an effective secessionist government. It’s a test case for libertarianism: to every adult male his own gun. Surprisingly, there is still economic life. Several competing cellphone companies offer good service – they are useful to the different warlords and left alone. I wonder if there isn’t also an informal solar sector.